The post for this week will be short and sweet since it’s Father’s Day, and because sadly I’ve been in a rush all day to leave on a business trip for most of the week. 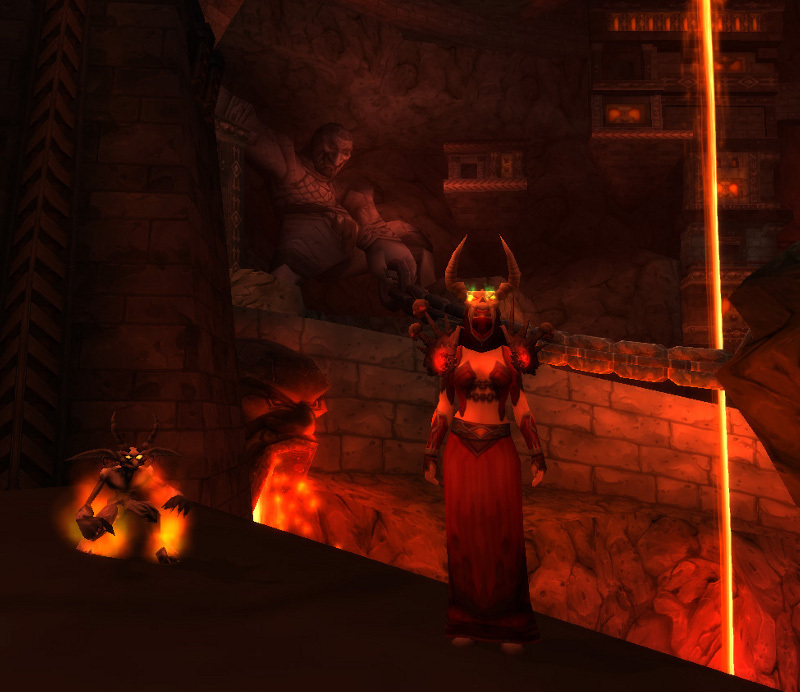 However, I would like to highlight the two contestants that took part in The Great Warlock “Epitome” Tmog Contest. Simple, yet makes a statement…very warlocky! All I can say is thanks for participating ladies! I really do appreciate your time and effort. Both sets bring out the personalities of their warlocks. What I find interesting is that both selected pieces from the Nemesis Recolor set. Saga with the Ritual Helm and Ninevi with the Vermillion Robes. That set in particular is quite tough to farm due to RNG playing a big factor. SAGA AND NINEVI! Yes, two winners out of two entries! I plan to make this an annual event, so start thinking about ideas for next year. The same rules will apply! Gratsie again, and thanks for participating! Truth be told I was really worried that the head wouldn’t drop in time. It was one of very few head pieces that even remotely worked with that chest. *lol* Now I have the difficult choice to make of which mount to get! Yep you won! I’ll be sending off the prize codes in just a few. You both made it easier by choosing the Heart of the Aspects Mount as well. You two have a lot in common – a good fashion sense along with a nice choice in mount preference! Woot grats to both of you! They both look wonderfully warlockish, looking forward to seeing them mounted! Thanks for the very fun contest, Amijade! I hope more people will take part next year, too! If it isn’t black mageweave set, I don’t like it. You can wear Black Mageweave on your mage all the time if you like and mailbox dance all you want. You have my permission :P Really, I see that set on human mages all the time and I hear that’s acceptable in mage circles. Also, good post and a refreshing quality of honesty on the “Sexism” post you did. Sadly, your comments section doesn’t like me when I’m on my iPhone – Not sure if it’s your blog provider or FeedreaderRSS (what I have been using), but I plan to change that soon and try other Apps out. I’ll let ya know if the new one I choose works better. I really like your blog. As a fellow warlock, I hope you don’t mind that I start linking it on any relevant forums! Keep up the good work, and awesome tmog’s girls! Thanks again, and no I don’t mind at all. I’m not a specialist by any means or a hard number cruncher. However, I’m passionate about our class and always enjoy running on my lock! 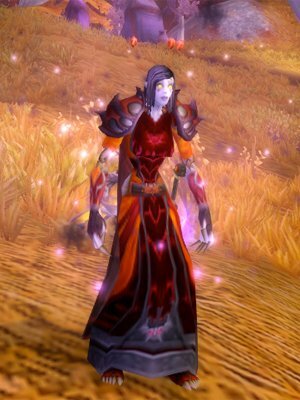 I’ll probably do another Tmog contest next year as well so start looking for Tmog ideas!